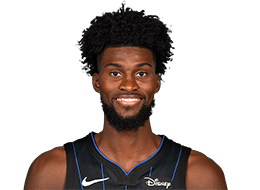 Playoff Central Live's Ro Parrish talks with Orlando's Jonathan Isaac. 2017-18 SEASON: Played in 27 games (ten starts) during his rookie campaign with Orlando, averaging 5.4 ppg., 3.7 rpg., 1.22 stlpg. and 1.11 blkpg. in 19.8 minpg.…As a starter, averaged 7.5 ppg., 3.8 rpg., 2.00 stlpg. and 1.00 blkpg. in 23.1 minpg…Scored in double figures three times, including a career-high 15 points on Apr. 1 @ Atlanta…Recorded at least one blocked shot 18 times and two-or-more blocks nine times, including a career-high three blocks three times, the last on Mar. 3 vs. Memphis…Recorded at least one steal 16 times and two-or-more steals 11 times, including a career-high five steals on Mar. 20 vs. Toronto...Made his NBA debut on Oct. 18 vs. Miami, tallying four points, a career-high eight rebounds and two blocked shots in 17 minutes…Recorded his first NBA points and rebound on a putback with 2:55 left in the first quarter…Made his first NBA start on Oct. 20 @ Brooklyn, tallying nine points, three assists, one rebound, two steals and one blocked shot in 23 minutes…Missed 51 total games due to injury: missed one game (Oct. 29) due to an illness, 17 games (Nov. 13-Dec. 15) due to a sprained right ankle, 24 games (Dec. 22-23, Dec. 28-Feb. 14) due to a sore right ankle, three games (Mar. 22-28) due to a left foot strain and six games (Apr. 3-11) due to a sprained left ankle…On the Inactive List four times…Also played in two games with Lakeland of the NBA G League, averaging 7.0 ppg., 3.0 rpg. and 2.00 stlpg. in 16.1 minpg. CAREER TRANSACTIONS: Selected by Orlando in the first round (sixth overall) of the 2017 NBA Draft…Played with Lakeland of the NBA G League (2017-18). Played and started in 32 games during his only season at Florida State University, averaging 12.0 ppg., 7.8 rpg., 1.2 apg., 1.53 blkpg. and 1.16 stlpg. in 26.2 minpg., while shooting .508 (130-256) from the floor, .348 (31-89) from three-point range and .780 (92-118) from the free throw line…Led the Seminoles in rebounding and blocked shots, while finishing second in scoring and steals…Named to the All-ACC Freshman Team and earned All-ACC Honorable Mention honors…His 7.8 rebounds per game set a school record for a freshman and were the most among all freshmen in the ACC in 2016-17…Named the ACC Rookie of the Week twice (Nov. 21, Jan. 23) and helped Florida State notch 26 wins, one shy of the school record, including 12 in conference play, which tied the school record for most ACC wins in a season. Full name is Jonathan Judah Isaac…Son of Jackie Allen…One of six children in his family – has one older sister, Kalilah, two older brothers, Jacob and Joel, and two younger brothers, Winston and Jeremiah…Majored in sport management while at Florida State…In 2015-16, played for IMG Academy in Bradenton, Fla., averaging 17.6 ppg. and 10.0 rpg., while shooting .510 from the floor…Competed in the Jordan Brand All-American Game (eight points, six rebounds and one block in 18 minutes) and was also a member of the USA Basketball Junior National Select Team that faced the World Select Team at the Nike Hoop Summit (seven points and four rebounds)…Also attended the International School in Hollywood, Fla., for two seasons (2013-15) and Barrion Collier High School in Naples, Fla., for two seasons (2011-13)…A native of Bronx, NY…You can follow him on Twitter: @jisaac_01.